Animals use the sense of hearing for many different purposes. It is used to sense danger and enemies, to detect prey, to identify prospective mates and to communicate within social groups. Some animals (e.g. most bats and dolphins) use sound to “see” by echolocation. By sending out a cry and interpreting the echo, they sense obstacles or potential prey. Most of the ear, the organ of hearing, is hidden from view within the boney skull. It consists of three main regions: the outer ear, the middle ear and the inner ear (see diagram 15.9). The outer ear consists of an ear canal leading inwards to a thin membrane known as the eardrumor tympanic membrane that stretches across the canal. Many animals have an external ear flap or pinna to collect and funnel the sound into the ear canal. The pinnae (plural of pinna) usually face forwards on the head but many animals can swivel them towards the source of the sound. In dogs the ear canal is long and bent and often traps wax or provides an ideal habitat for mites, yeast and bacteria. The middle ear consists of a cavity in the skull that is connected to the pharynx(throat) by a long narrow tube called the Eustachian tube. This links the middle ear to the outside air so that the air pressure on both sides of the eardrum can be kept the same. Everyone knows the uncomfortable feeling (and affected hearing) that occurs when you drive down a steep hill and the unequal air pressures on the two sides of the eardrum cause it to distort. The discomfort is relieved when you swallow because the Eustachian tubes open and the pressure on either side equalises. 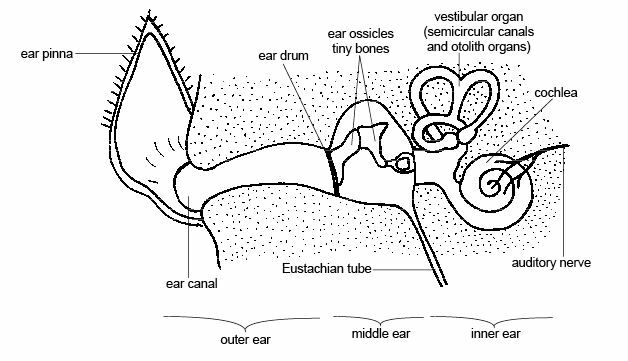 Within the cavity of the middle ear are three of the smallest bones in the body, the auditory ossicles. They are known as the hammer, the anvil and the stirrup because of their resemblance to the shape of these objects. These tiny bones articulate (move against) each other and transfer the vibrations of the eardrum to the membrane covering the opening to the inner ear. The inner ear is a complicated series of fluid-filled tubes imbedded in the bone of the skull. It consists of two main parts. These are the cochlea where sound waves are converted to nerve impulses and the vestibular organ that is associated with the sense of balance and has no role in hearing (see later). The cochlea looks rather like a coiled up snail shell. Within it there are specialised cells with fine hairs on their surface that respond to the movement of the fluid within the cochlea by producing nervous impulses that travel to the brain along the auditory nerve. Sound waves can be thought of as vibrations in the air. They are collected by the ear pinna and pass down the ear canal where they cause the eardrum to vibrate. (An interesting fact is that when you are listening to someone speaking your eardrum vibrates at exactly the same rate as the vocal cords of the person speaking to you). The vibration of the eardrum sets the three tiny bones in the middle ear moving against each other so that the vibration is transferred to the membrane covering the opening to the inner ear. As well as transferring the vibration, the tiny ear bones also amplify it. The three tiny bones are called the stirrup, anvil, and hammer. They were called such of their form. In the human ear this amplification is about 20 times while in desert-dwelling animals like the kangaroo rat it is 100 times. This acute hearing warns them of the approach of predators like owls and snakes, even in the dark. The vibration causes waves in the fluid in the inner ear that pass down the cochlea. These waves stimulate the tiny hair cells to produce nerve impulses that travel via the auditory nerve to the cerebral cortex of the brain where they are interpreted as sound. The hair cells generate a nerve impulse that travels down the auditory nerve to the brain. Remember that sound waves do not pass along the Eustachian tube. Its function is to equalise the air pressure on either side of the tympanic membrane.